The Bruce Mansion is exactly what you picture when you think, “haunted house.” It not only looks the part, but also has the activity to back it up. 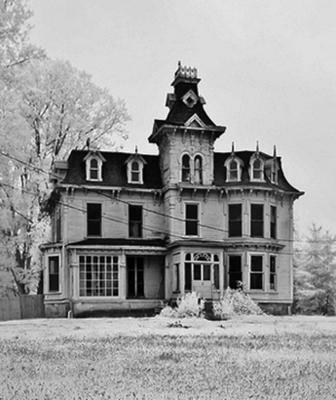 Built in 1876, it is a 3-story Victorian mansion. There have been many confirmed deaths in the house and the town claims even a murder suicide. Witnesses have reported seeing human and animal apparitions, items moving on their own, shadow figures, hearing unexplained voices, and more. People frequently capture evidence in the home like intelligent EVPs and photographic anomalies. There are accounts of countless apparitions being seen; a long-necked women in a yellow dress being seen outside, an older man with a long beard in period clothing also seen outside, an older man in old-style clothing and a top hat seen on the 2nd floor, a shadow man in the old coal room located in the Michigan basement, a ghost cat in the parlor and office, a dog in the basement. this house is worth saving. The Bruce Mansion is now offering public ghost hunts. Upcoming dates are Saturday, May 11 and Saturday, May 25. Visit www.BruceMansion.com for a complete list of events. Paranormal classes, historical tours, and private ghost hunts and events are also available. Very cool place to visit. Just found this EVP posted on YouTube. It is pretty cool. This place is one of the freekishly charmimg places I have ever seen! I am so excited it is now open for business! Can't wait to explore!